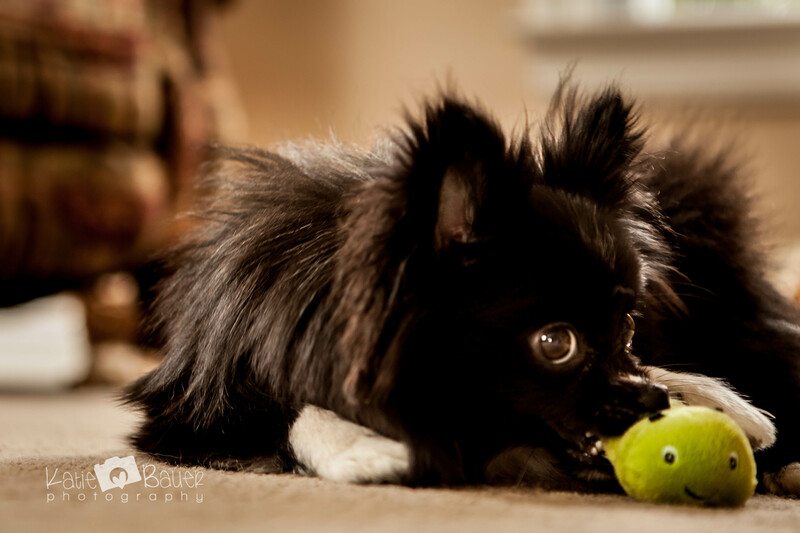 Strax’s favorite past time… chewing on things. I’m currently working on a different post, but I figured I’d leave you with this sweet little face in the mean time. This is my dog, Strax. Yes, he’s named after Strax from Doctor Who, and the name is absolutely fitting. My husband often recites the line to him that the Doctor said to (Sontaran) Strax at one point, “You’re not clever, you’re not funny, and you’ve got tiny little legs!” And if you’re not a Doctor Who fan, that will go right over your head. Anyway. He’s supposedly a pomeranian- a “Parti Pom” as they call it. We even have papers for him (although I never filled them out and actually lost them a few weeks after we got him because I don’t really care to register him)… but I personally think he’s got a bit of Papillion mixed in because of those big butterfly ears and long spindly legs. I don’t care one way or another about his bloodline, because I’d love him just as much whether he were a scrappy little mutt or a glorious champion. By the way… he’s FAR from a champion. Hah. Strax will be 1 year old on the 16th of this month! My husband and I got him back in February, when he was only 4 months old. He was the tiniest little guy- around 2 pounds if I remember correctly. Now he’s about 6 pounds. He used to have a white stripe down the front of his head between his ears (we called it his mowhawk), but you can only slightly see where it was now. Actually- when I took him for his first vet visit, everyone thought I was bringing in a skunk! The girls that worked there fell in LOVE with him, and when we were waiting in the room for him to be weighed, one girl had to peek her head in to let me know it would take a little longer, because everyone had to pass him around and ooh and ahh. Strax came into our lives unexpectedly, actually. A little over a year ago, someone contacted my mom about adopting her 8 year old pomeranian. Now, mom is a relatively well-known pet groomer in our area, and she’s also into rescue adoption, particularly pomeranian rescue. When I was in high school, she adopted Cruz, their little 90% bald pomeranian. You may have seen him in one of my first blog posts, appearing as the ring bearer for my wedding. For the first six or so years of his life, he was a champion breeder and show dog, but started showing signs of an incurable genetic skin disorder which made his fur fall out. Since breeders and showpeople (showpeople?? Is that what they’re called?) don’t really have any purpose for a dog with genetic disease, no matter how adorable and sweet he may be, they surrendered him to a rescue. This was probably the best thing that could have happened to Cruz. When she adopted him, he still had most of his gorgeous coat and was only missing a tiny patch on his hip. Now, he only has fur on his head and feet. Because of this, he has extremely sensitive skin and has to wear pajamas all the time to avoid overstimulation and getting cold. Oh. And he shakes all the time. So because we the have baldness, constant pajama wearing, and the fact that at around 5 pounds he’s the smallest member of the house (yes, even smaller than the cat, Pumpkin- the other pet being their 100 pound pit/lab mix, Jade) and is the complete and total ruler of the house, Cruz is a comical sight to see. But he’s by far the most spoiled little thing I’ve ever met! Mom is obsessed with him. ANYWAY. A lady named Jean contacted mom to ask if she would be interested or if she knew of anyone who’d be interested in adopting her little 8 year old pomeranian, Sassy, because she had terminal lymphoma and didn’t have much longer to live. Mom and dad already had two dogs and a cat, so they weren’t especially looking to adopt another animal. I talked it over with the husband, and we decided we’d take her. However, Jean wanted to make certain that Sassy would fit in well with her new home before she was gone, so she wanted us to take her nearly immediately. My husband and I were in the process of moving back to our hometown, so adding a dog to the mix right then was difficult, and we ended up having Sassy stay with mom and dad until we got settled. Well, after a month or so, Jean made a visit and saw how well Sassy fit in with mom and dad’s little fuzzy family. There were other dogs to keep her company, and she had latched onto my dad pretty well. Jean asked if there was any way they could possibly keep Sassy… and that she would BUY me another dog. I was okay with that. So I was told to start looking for a pomeranian. I personally didn’t care what type of dog I got, and I was extremely busy at the time and slacked off on searching. Suddenly, one day Jean let mom know that she’d seen an ad for a little black and white pomeranian, and that I should go look at him immediately before the lady (who was in town visiting her mother) had him left the state to go back home. I happened to be at a friends house, which was about halfway to the town little Strax was in at the time, so I grabbed my friend Beth and we took off to see him. I walked in the door, the lady brought him to me, and immediately I knew he was the one. We left him there that night, and the next day Mom, Jean, and I all left to pick him up. Sassy is still happily living with mom and dad – although over the summer, she grew UNBELIEVABLY attached to my younger sister who was home for college… so much so that she went into a depression for a few weeks after she went back (she was more upset when Caroline left than she was when she transitioned from her home of 8 years to my parents’ house), so it has been decided that Sassy will ultimately live with Caroline, whenever she happens to move out on her own after college. This little guy can be quite the hand full, but he’s my love. At first I was honestly worried that we’d never get him trained to the point of good behavior, even despite the advice I’d heard that pomeranians don’t really have a brain until they’re about a year old so they don’t learn very young, but they learn well when they finally do.. Now, I think it’s so cute how I can just tell he wants to make me happy- that his WORLD revolves around me, but he’s still figuring out how to behave. He’s improved so much in the past three months though. He knows how to come, how to sit, stay (we can drop a treat on the floor and walk out of the room… he’ll just sit there staring intently at it until he hears his release word, OKAY!) and we’re working on laying down.